It’s been almost two months since we heard anything about the Samsung Illusion. The last time we saw anything about it was when an image leaked out on Flickr about the handset being certified as green, and since then things have been fairly quiet. Finally some specs have shown up, and it’s sporting a bit more power than we suspected it might. Back when the phone first leaked out we thought it would only be running an 800 MHz processor, but thanks to AndroidCentral we’ve now learned that instead its going to be powered by a 1 GHz Hummingbird chip. While it still won’t be setting any quadrant score records, it should be a pretty decent handset. Besides the chip finally being revealed, we’ve also learned that it will be sporting a 3.5-inch HVGA (480×320) screen, a 3 megapixel rear camera, 512MB of RAM, 2GB of internal storage and a MicroSD slot with an included 2GB card. All of this will be powered by Android 2.3 Gingerbread running on a 1500 mAh battery. No release date or pricing has been announced as of yet, but the rumors seem to indicate November 17 if you’re looking to pick one of these up. 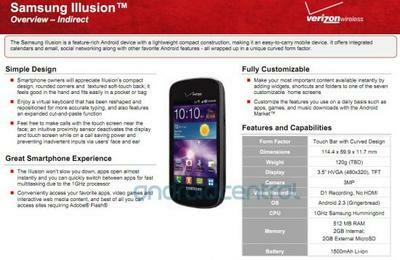 Do you have any interest in the Samsung Illusion?